With China’s export-centered economy looking increasingly unbalanced and unsustainable, there has been growing public support for state involvement in the interests of rural development. Yasheng Huang, of MIT’s Sloan School of Management, provides a powerful economic rationale to this emerging movement with his new book Capitalism with Chinese Characteristics. Huang argues that urban biased government policies over the past fifteen years are the cause of skewed proportions of China’s economy and have tremendously hindered stable private sector growth. Huang debunks the consensus view that China’s economy has become increasingly open to private enterprise during the thirty year of the reform period, suggesting an alternative narrative of a resurgent state sector sidelining the vibrant, sustainable and equitable development pattern of the 1980s. Huang centers his analysis of China’s reform period on the often neglected rural economy of the 1980s, a period he dubs the “The Entrepreneurial Decade.” To Huang, the 80s pattern of rural development of private sector labor intensive production offered the possibility of a “virtuous” development based on a trajectory commonly seen in other East Asian developing nations. The beating heart of this decade’s growth is the dynamic role played by the Township and Village Enterprises (TVE), which provide both mass employment and management opportunities for poor but entrepreneurial residents. To get TVEs off the ground, aspiring entrepreneurs either pooled capital informally or were able to access official sources due to lenient credit policies encouraged by senior party leadership. In contrast to many observers, of which Huang singles out Joseph Stiglitz as the main offender, these organizations are shown to be functionally private operations cloaking themselves in the necessary legal fiction that they are collective entities in order to register with the government. One of the recurring themes of the book is the extent to which foreign observers continue to grossly misunderstand cultural and administrative terminology and functional differences between China and other nations, in this case misunderstanding TVEs as an organizational identifier rather than merely denoting locality. To work around the criticism that weak property rights and government policies were still relatively unfriendly to private capitalism in the 1980s Huang articulates the notion of “Directional Liberalism.” This term encapsulates his contention that faith in property rights and recognition of profits are relative concepts, and that, although the business environment in China in the 1980s was nowhere near the standard of the Washington Consensus, incremental positive changes were nevertheless sufficient to encourage hard work and risk-taking by rural individuals when judged from a pre-1978 perspective. The representative Horatio Alger figure in Huang’s narrative of this period is Nian Guangjiu, a rural entrepreneur who successfully brands his sunflower seeds as “Idiot Seeds” and quickly expands from four workers in Anhui to hundreds of employees distributing seeds across China. In 1989, Nian Guangjiu was arrested on vague charges of hooliganism and immoral relationships during the post-Tiananmen crackdown, and like Nian the initial, balanced stage of China’s reform development came to an end and the urban-centric 1990s began. 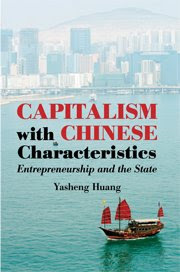 Where the story of the 1980s was fundamentally about the rural private-sector, the following decade was dominated by a shift to capital-intensive, state-directed urban development described in the chapter titled “The Great Reversal.” It is in the analysis of the 1990s where Huang significantly deviates from conventional narratives of China’s private sector growth, which focus on the private sector’s increasing share of output rather than his preferred method: using measures of capital inputs to determine the policy environment. Per Huang’s interpretation, fears that the economy is moving outside the control of the party’s leadership led the state to increase its role in the setting of investment priorities, for example by shoring up SOEs, building urban infrastructure, and initiating national prestige projects. This policy shift reflected the post-1989 leadership transition, which saw pragmatic, patient reformers with experience in rural areas replaced by a bevy of Shanghai technocrats and risk-averse party apparatchiks. The result was a steady squeezing of entrepreneurs through more restrictive government regulations and tighter macro-economic policy controls which limited private access to credit. As a consequence of this gradual restricting of opportunity in the countryside, the rural population became a pool of cheap, migrant labor rather than potential entrepreneurs. Locked out of asset appreciation and forced to rely only on unskilled labor positions to supplement their income, rural residents net income growth rates plummeted both in absolute terms and relative to urban households. The end result of this statist investment bias was the rapid but hollow development of showroom cities, which Huang pointedly skewers in the final substantive chapter “What is Wrong with Shanghai?” In chart after chart, Huang successfully makes the case that the development of Shanghai into a world-class city that receives global praise for its infrastructure and breathtaking development has harmed China’s real economic growth trajectory. Huang’s list of Shanghai’s failings is long and angry: income levels that have failed to match the rapid ascent of per capita GDP, income inequality that has continually widened since the late 1980s, a private sector starved for capital, incredible corruption in land development and infrastructure projects, a bloated, greedy government. As with most works on economics, it is sometimes difficult to bridge the massive gap between common and specialized knowledge, but aside from several paragraphs groaning with statistics Capitalism with Chinese Characteristics should be readable (barely) by a general audience. The genuine outrage at what Huang feels to be an unjust and unbalanced pattern of development gives the work a passion most political economy works lack, although his depiction of some well-respected economists such as David Dollar of the World Bank can be overly harsh. Overall, the conclusions Huang arrives at are cogent and convincing; the 1980s were a vibrant era whose lessons have been ignored; China has significantly deviated from the East Asian model into a Latin American style economy; and although capitalism in China has deeper roots today than in the 1980s, the fruits of development are increasingly falling into the hands of the state or the rich. In the midst of this depressing account, Huang seems optimistic about China’s future. He approves of the policy initiatives of the Hu-Wen government although he is unsure whether their rhetoric to re-balance and improve the livelihood of poor and rural Chinese will overcome entrenched interests. In this respect I think some of Huang’s optimism is misplaced. The recent Chinese economic stimulus package continues to favor capital intensive government industries like steel that produce prestige goods for the leadership--such as Olympic stadiums and potentially aircraft carriers--rather than rural education or healthcare. In the midst of a turbulent global economy Capitalism with Chinese Characteristics should, and judging by the initial response will make economists and policy makers pause to consider how China got into its current situation and what its proper economic objectives should be. Yasheng Huang did an excellent job in describing the policy constraints Chinese private businesses face and how some of the best "Chinese" enterprises are actually foreign registered, but the book is weak in theorizing. His main argument seems to be a theory of personal origin (Jiang Zemin was from Shanghai so he favored urban areas, and Zhao Ziyang etc. were from the rural provinces so they favored rural areas). Mary Gallagher's 2002 paper in World Politics analyzes similar things and her theory, that favoring foreign investment rather than domestic private businesses contribute to political stability, is much stronger and more persuasive. A side note about Lenovo's Hong Kong registration status: it was indeed a pity that Lenovo had to do this to protect itself---it certainly raises transaction costs by a lot (as compared to the case if it could enjoy similar policy protection and favor if it was registered in Beijing). But as long as Lenovo keeps investing in China, and not transfering its capital to some foreign country (of course this cannot be ruled out), the loss for China is not that horrible. Of course, the best case scenario is still for Lenovo and other Chinese businesses to enjoy better treatment domestically.